The main job purpose of a Literacy Tutor is to help an adult learner to develop and enhance reading and writing skills as a means to meet their self-identified goals. 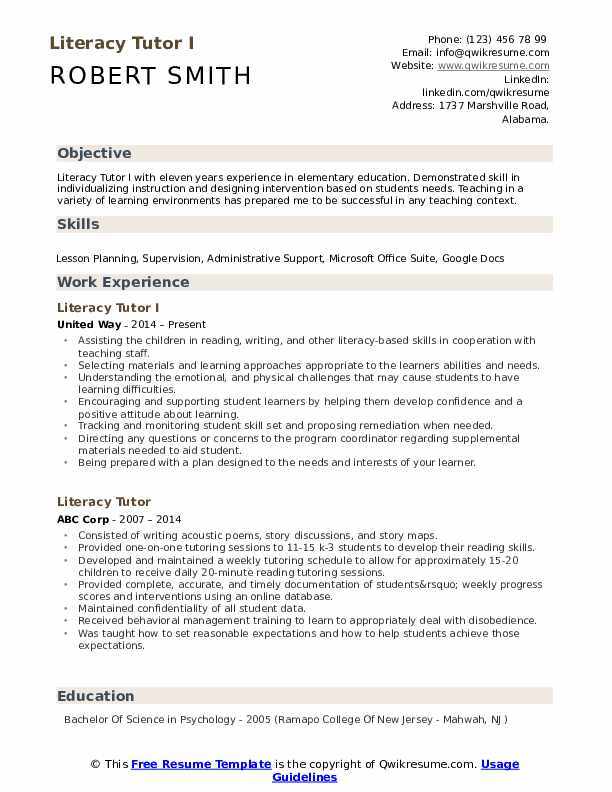 The duties that are highlighted on the Literacy Tutor Resume include – assisting struggling students in identifying their literacy skills, collaborating with teachers to promote learning and implementation of effective learning strategies, helping the institute in improving literacy instructions, measuring the success of literacy programs and getting necessary feedback. 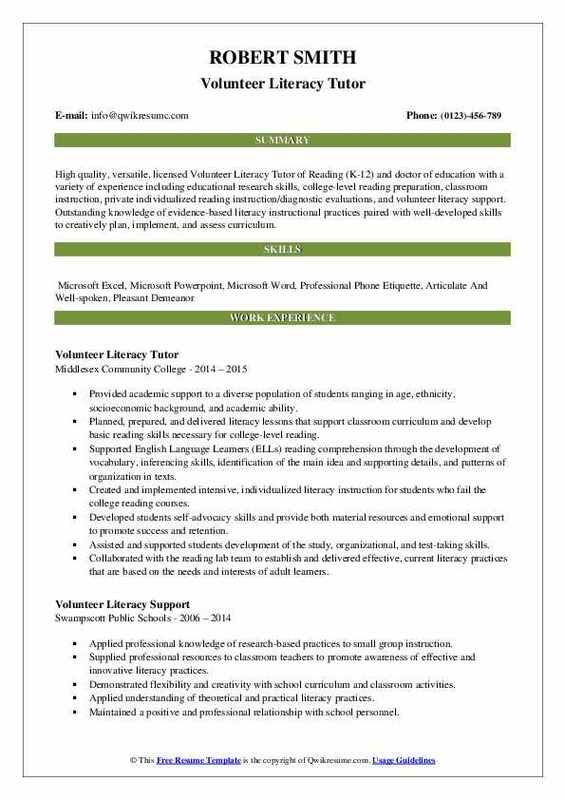 The background and qualification required for a Literacy Tutor include – teaching expertise in various school settings, knowledge of Common Core Literacy standards, experience in using various assessment tools, strong reading and writing skills, a mature demeanor and being optimistic. A degree in English or Special Education is commonly seen on most of the resumes, however, a Master’s in Reading Instruction is preferred. 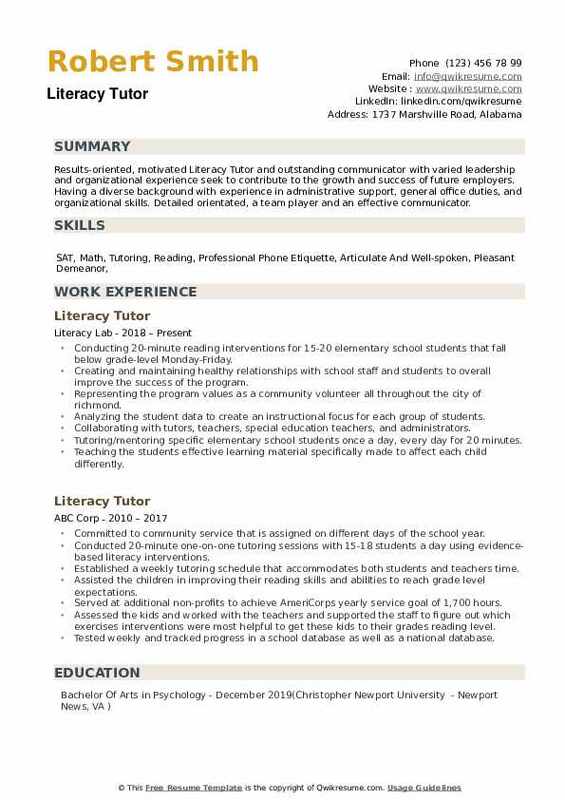 Summary : Literacy Tutor I with eleven years experience in elementary education. Demonstrated skill in individualizing instruction and designing intervention based on students needs. Teaching in a variety of learning environments has prepared me to be successful in any teaching context. Assisting the children in reading, writing, and other literacy-based skills in cooperation with teaching staff. Selecting materials and learning approaches appropriate to the learner's abilities and needs. Understanding the emotional, and physical challenges that may cause students to have learning difficulties. Encouraging and supporting student learners by helping them develop confidence and a positive attitude about learning. Tracking and monitoring student skill set and proposing remediation when needed. Directing any questions or concerns to the program coordinator regarding supplemental materials needed to aid student. Being prepared with a plan designed to the needs and interests of your learner. Reviewing all homework completed independently by your learner each week. Notifying the program staff of any change in tutoring status, schedules or locations, as well as any. 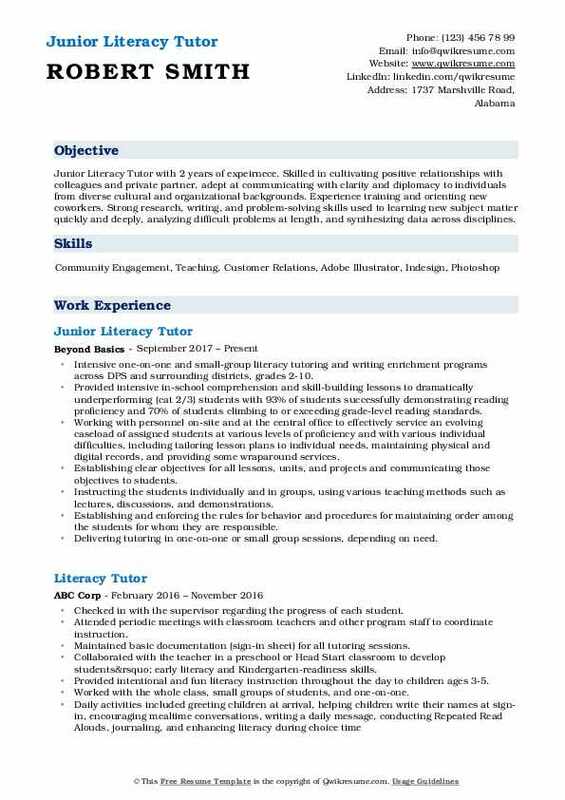 Objective : Literacy Tutor with 3 years of experience. Uses logic and reasoning to identify the strengths and weaknesses of alternative solutions, conclusions or approaches to problems. Aware of different theories and strategies to work with children. Gives full attention to what other people are saying, takes time to understand the points being made. Caring, friendly, and great working with children and staff. Experience working with struggling readers. Choosing materials appropriate to the learners reading level and goals. Working with two 2nd grade students and two 3rd grade students, all in a bilingual program. Creating and developing a Response To Intervention (RTI) program along with the Supervisor to help 19 students struggling with math content. This pilot program was designed to help 3rd grade students who scored below average, on the benchmark tests, improve their strategies. Created an individualized plan for every student that targets their weaknesses and helps improve their skills. Helped students developed correct/appropriate mathematical terminology. Created different lesson plans each week according to each student's needs. Created a letter for parents informing them what we did in each session. 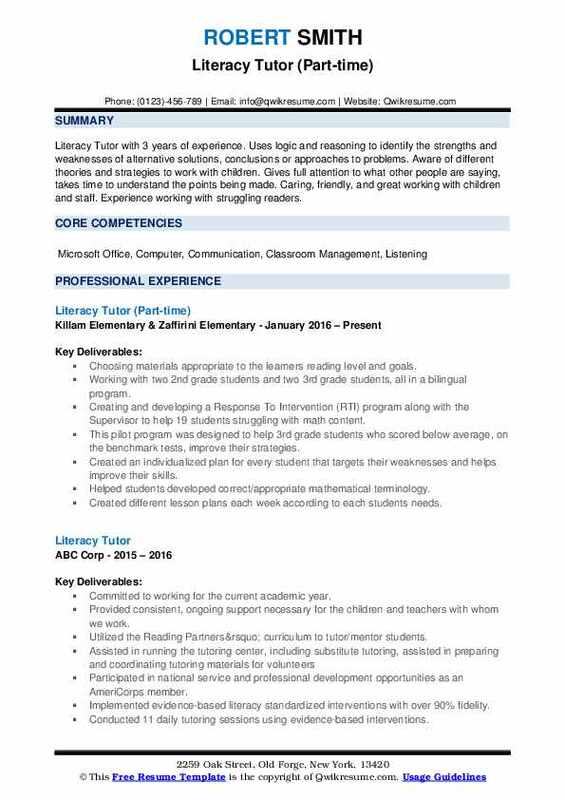 Summary : High quality, versatile, licensed Volunteer Literacy Tutor of Reading (K-12) and doctor of education with a variety of experience including educational research skills, college-level reading preparation, classroom instruction, private individualized reading instruction/diagnostic evaluations, and volunteer literacy support. Outstanding knowledge of evidence-based literacy instructional practices paired with well-developed skills to creatively plan, implement, and assess curriculum. Provided academic support to a diverse population of students ranging in age, ethnicity, socioeconomic background, and academic ability. Planned, prepared, and delivered literacy lessons that support classroom curriculum and develop basic reading skills necessary for college-level reading. Supported English Language Learners (ELLs) reading comprehension through the development of vocabulary, inferencing skills, identification of the main idea and supporting details, and patterns of organization in texts. Created and implemented intensive, individualized literacy instruction for students who fail the college reading courses. Developed students self-advocacy skills and provide both material resources and emotional support to promote success and retention. Assisted and supported students development of the study, organizational, and test-taking skills. Collaborated with the reading lab team to establish and delivered effective, current literacy practices that are based on the needs and interests of adult learners. 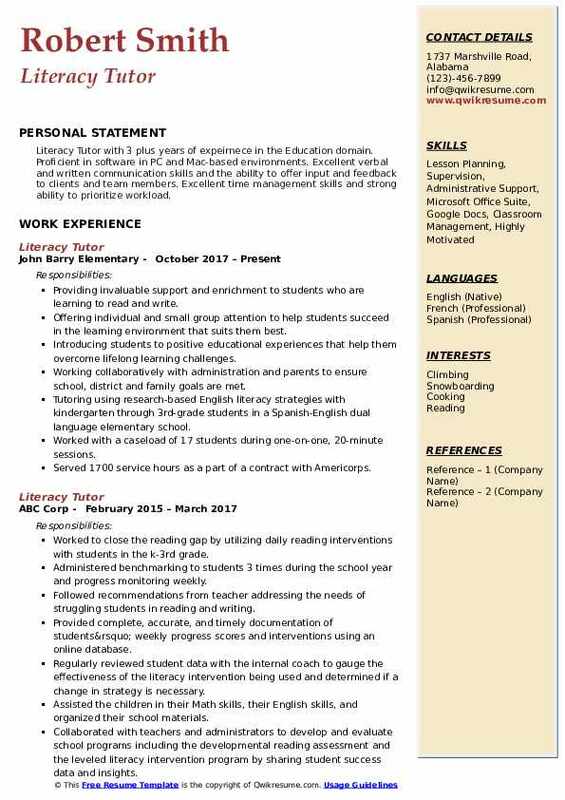 Objective : Passionate Literacy Tutor with expertise in curriculum development, classroom management, data tracking, relationship building, and working in under-served communities. Strong spoken and written communication skills coupled with an exceptional ability to engage and motivate students through dynamic instruction that embraces individuality and values positive relationships. Provided individual literacy tutoring sessions using scripted reading materials. Communicated professionally with internal coaches, principals, and school staff regarding scheduling, progress, and interventions. Documented weekly progress scores and interventions using an online database system. Reviewed student data regularly with internal coaches to gauge the effectiveness of the literacy interventions and determine if a change in strategy is necessary. Volunteered and engaged in school-sponsored activities such as family night and book fairs. Assisted with other miscellaneous duties in the office and classrooms as assigned by the internal coaches. Positive reinforcement, love for children and open communication with students, teachers, and faculty. Interpersonal skill development with children, teachers, coaches, and principals. 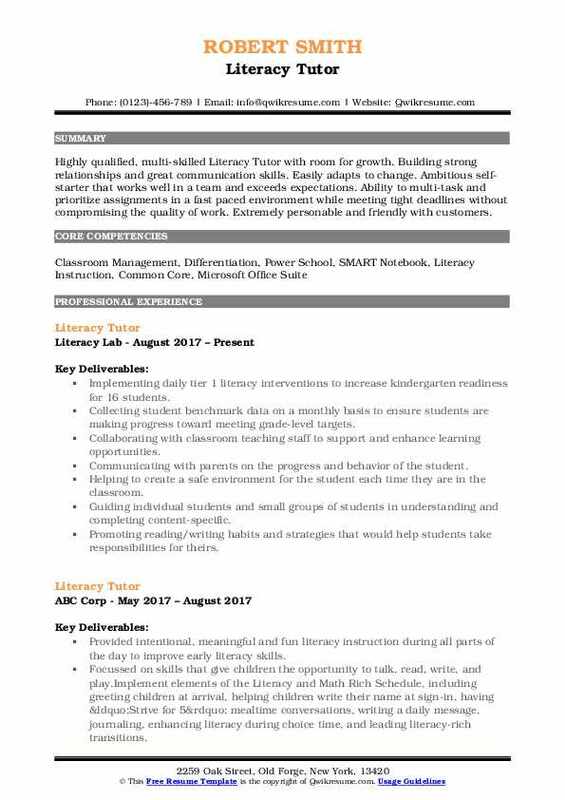 Objective : An energetic, innovative, and progressive Literacy Tutor possessing a unique arrangement of creative and analytical skills advantageous to a dynamic and mission-driven organization. 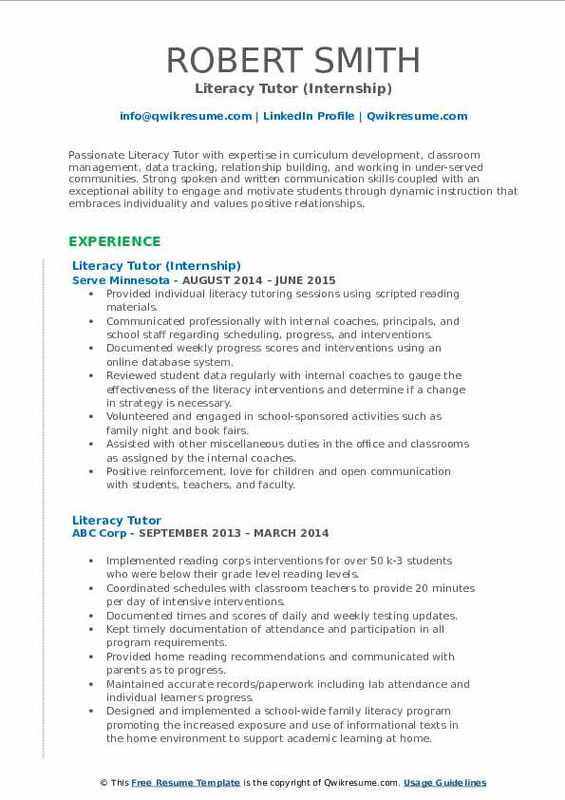 Searching for a rewarding literacy position within a highly invested school environment where strong collegial relationships are valued and individual reading success is held paramount. Worked used evidence-based literacy interventions to provide supplemental practice to children in kindergarten through third grade to develop their reading skills. Saw that each student daily in a one-on-one setting using 10 structured, scripted early literacy. Provided opportunities for family literacy involvement for reading corps students including implementing the reading corps family engagement literacy intervention. Conducted one-on-one tutoring sessions with students using scripted, evidence-based literacy interventions provided by Reading Corps. Achieved a high degree of fidelity to the scripted interventions. Assisted the children in improving their reading skills and abilities to reach grade level expectations. Developed and maintained a weekly tutoring schedule which maximizes the number of students served and allows each child to receive daily 20-minute reading tutoring sessions using prescribed literacy interventions. Assessed with a high level of accuracy, students’ continual progress using tri-annual benchmark assessments and ongoing progress monitoring assessments. Objective : Junior Literacy Tutor with 2 years of expeirnece. Skilled in cultivating positive relationships with colleagues and private partner, adept at communicating with clarity and diplomacy to individuals from diverse cultural and organizational backgrounds. Experience training and orienting new coworkers. Strong research, writing, and problem-solving skills used to learning new subject matter quickly and deeply, analyzing difficult problems at length, and synthesizing data across disciplines. Intensive one-on-one and small-group literacy tutoring and writing enrichment programs across DPS and surrounding districts, grades 2-10. Provided intensive in-school comprehension and skill-building lessons to dramatically underperforming (cat 2/3) students with 93% of students successfully demonstrating reading proficiency and 70% of students climbing to or exceeding grade-level reading standards. 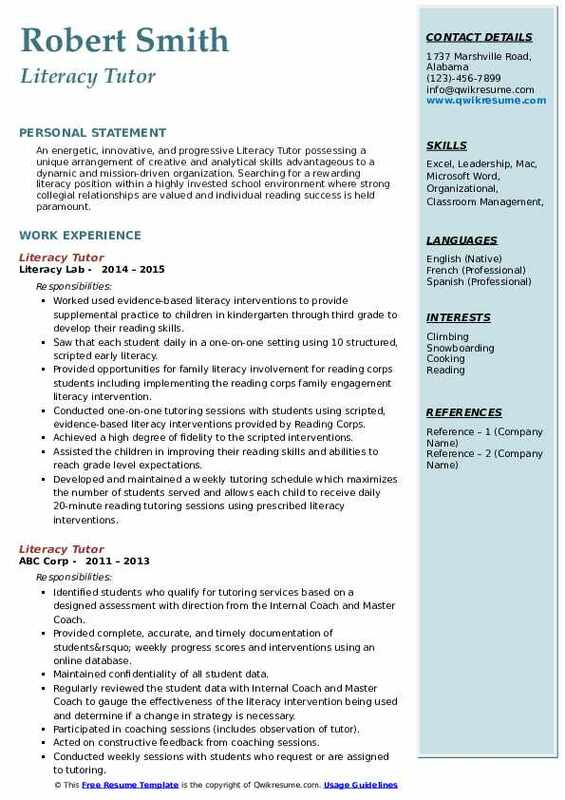 Working with personnel on-site and at the central office to effectively service an evolving caseload of assigned students at various levels of proficiency and with various individual difficulties, including tailoring lesson plans to individual needs, maintaining physical and digital records, and providing some wraparound services. Establishing clear objectives for all lessons, units, and projects and communicating those objectives to students. Instructing the students individually and in groups, using various teaching methods such as lectures, discussions, and demonstrations. Establishing and enforcing the rules for behavior and procedures for maintaining order among the students for whom they are responsible. Delivering tutoring in one-on-one or small group sessions, depending on need. 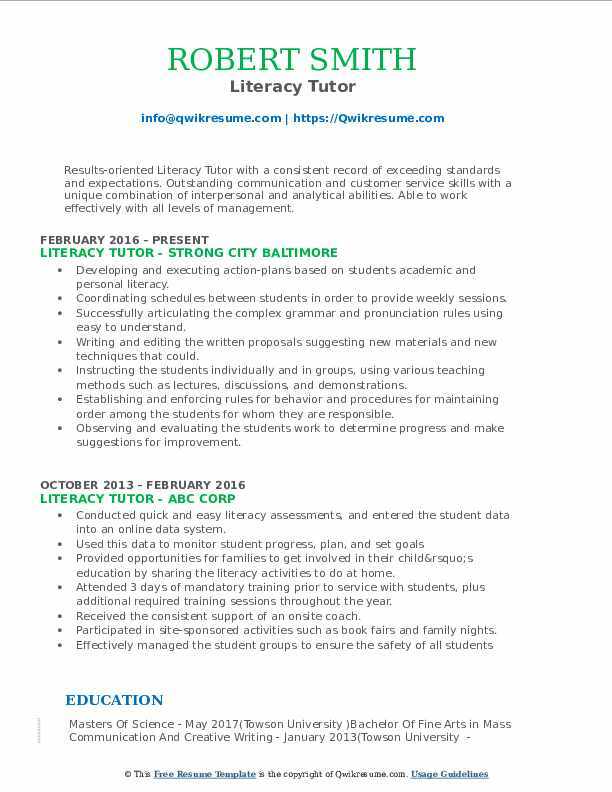 Headline : Results-oriented Literacy Tutor with a consistent record of exceeding standards and expectations. Outstanding communication and customer service skills with a unique combination of interpersonal and analytical abilities. Able to work effectively with all levels of management. Developing and executing action-plans based on students academic and personal literacy. Coordinating schedules between students in order to provide weekly sessions. Successfully articulating the complex grammar and pronunciation rules using easy to understand. Writing and editing the written proposals suggesting new materials and new techniques that could. Establishing and enforcing rules for behavior and procedures for maintaining order among the students for whom they are responsible. Observing and evaluating the students work to determine progress and make suggestions for improvement. Conducting one-on-one tutoring sessions with students using scripted, evidence-based literacy interventions provided by reading corps, while also providing additional opportunities for family literacy involvement outside of the classroom. Objective : Highly qualified, multi-skilled Literacy Tutor with room for growth. Building strong relationships and great communication skills. Easily adapts to change. Ambitious self-starter that works well in a team and exceeds expectations. Ability to multi-task and prioritize assignments in a fast paced environment while meeting tight deadlines without compromising the quality of work. Extremely personable and friendly with customers. Implementing daily tier 1 literacy interventions to increase kindergarten readiness for 16 students. Collecting student benchmark data on a monthly basis to ensure students are making progress toward meeting grade-level targets. Collaborating with classroom teaching staff to support and enhance learning opportunities. Communicating with parents on the progress and behavior of the student. Helping to create a safe environment for the student each time they are in the classroom. Guiding individual students and small groups of students in understanding and completing content-specific. Promoting reading/writing habits and strategies that would help students take responsibilities for theirs. Observing and evaluating students work to determine progress and making suggestions for improvement. Objective : Literacy Tutor with 3 plus years of expeirnece in the Education domain. Proficient in software in PC and Mac-based environments. Excellent verbal and written communication skills and the ability to offer input and feedback to clients and team members. Excellent time management skills and strong ability to prioritize workload. Providing invaluable support and enrichment to students who are learning to read and write. Offering individual and small group attention to help students succeed in the learning environment that suits them best. Introducing students to positive educational experiences that help them overcome lifelong learning challenges. Working collaboratively with administration and parents to ensure school, district and family goals are met. Tutoring using research-based English literacy strategies with kindergarten through 3rd-grade students in a Spanish-English dual language elementary school. Worked with a caseload of 17 students during one-on-one, 20-minute sessions. Served 1700 service hours as a part of a contract with Americorps. Volunteered with literacy projects regularly in the community. Summary : Results-oriented, motivated Literacy Tutor and outstanding communicator with varied leadership and organizational experience seek to contribute to the growth and success of future employers. Having a diverse background with experience in administrative support, general office duties, and organizational skills. Detailed orientated, a team player and an effective communicator. Conducting 20-minute reading interventions for 15-20 elementary school students that fall below grade-level Monday-Friday. Creating and maintaining healthy relationships with school staff and students to overall improve the success of the program. Representing the program values as a community volunteer all throughout the city of richmond. Analyzing the student data to create an instructional focus for each group of students. Collaborating with tutors, teachers, special education teachers, and administrators. Tutoring/mentoring specific elementary school students once a day, every day for 20 minutes. Teaching the students effective learning material specifically made to affect each child differently. Maintaining test score and helping to keep each child above the provided aim line.